Joe’s Place is an upscale, boutique Pilates & Movement Studio located exclusively in Harwich, MA. 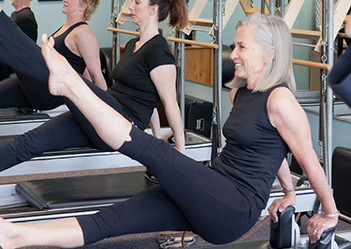 Founded in 2000 and equipped with the full complement of Gratz apparatus, we are Cape Cod’s first, and still its only Authentic™ Pilates studio! Founded in 2000, we have been bringing Authentic Pilates training to the Cape for more than 20 years. We want you to master the magic, not just mimic the movements of the Pilates method, so we teach the real thing, the way it was intended and we make it fun! We’ve got the right stuff! We have the experience and expertise to safely and effectively guide you to where you want to go. Our comprehensive education in Pilates is supplemented by complementary training in personal training, massage, health coaching, and functional movement – making us uniquely equipped to prescribe just the right program for your needs. 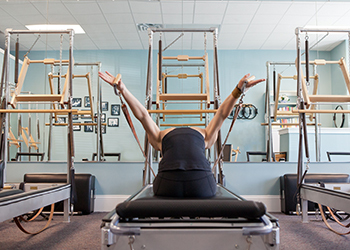 We offer a free initial consultation visit that provides ample time for an assessment of your individual needs and goals, a demo and discussion of what Pilates can do for you, a “test drive” of the Pilates apparatus and exercises, and a feel for the chemistry here at Joe’s Place.